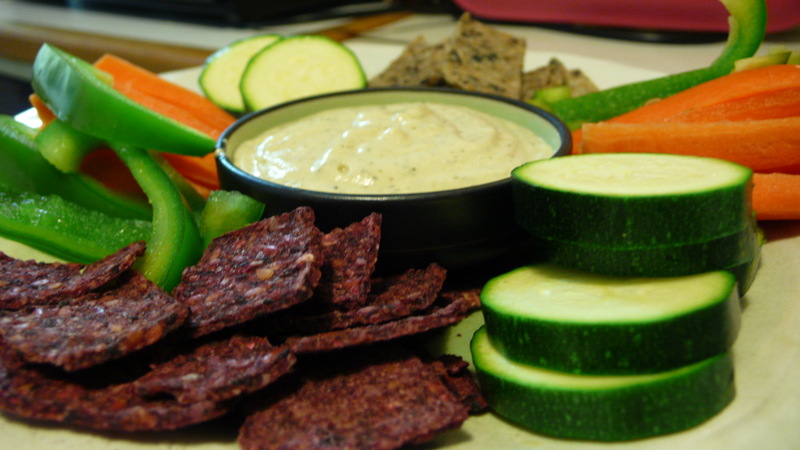 If you are thinking about eating more raw veggies, dipping crudités is a great place to start. But of course some of the most popular dipping delights are creamy and cow-milk based. A great alternative for almost any creamy sauce can be made from nuts and seeds: like today’s recipe which is based on cashew nuts, which are a good source of protein and calcium and are packed with huge amounts of minerals not to mention monounsaturated fat (the good kind). It’s raw ranch. I decided not to call it Rawnch. Blend everything on high speed until smooth and creamy. Stir in fresh herbs. Serve with crudités, raw crackers such as Biscru or toss in salad.